In Dark Souls 3, you meet Leonhard, who wants to lure you into the world of dark spirits. This means that you will get through it the ability to penetrate the worlds of other players and to combat them. However, Leonhard, the ringfinger offers more than that because once you have completed his quest, you will be richly rewarded. In this article we guide you through the quest of Leonhard in Dark Souls 3. 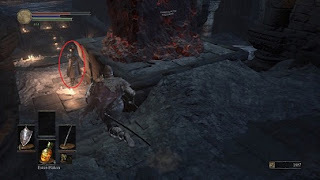 Have you found the firelink shrine in Dark Souls 3, Leonhard is not far away. Once you defeat Vordt from Nordwindtal, you will see the Leonhard shrine. Go to the King Lothric and talk to him until you have presented 5 Cracked Red eyeballs. The quest of Leonhard, the ringfinger in Dark Souls 3 starts. - Speak with Leonhard in firelink shrine until he gives you a Lift Chamber Key. In order for you to open the gate below the tower. - Drive down and defeat the dark spirit to obtain a Red Eye Orb. - Go back to Leonhard and speak with him, so he hands you the Red Eye Orb. - Once you arrived at the Cathedral of the abyss, you will meet Rosaria in bedchamber after you join Rosaria's Finger covenant and offer her at least one Pale Tongue. Note that you characterized the quest of Sirris will completely cancel. - Make your way to the exit of the bedroom and speak with Leonhard. Then you play Dark Souls 3 until you ignite the bonfire in the Profaned Capital or killing the giant Yhorm. - Return to Rosaria's bedchamber and note that Leonhard, the ringfinger – Rosaria is killed. Collect the Black Eye Orb. - Are you in a chamber above Aldrich's Bonfire, the gods eater in Anor Londo, you get the message: "The black eye orb is trembling". - Leonhard calls you in his world and you can take this now to invade and defeat him by using the Black eye orb. If you kill Leonhard before completing his quest, you will only get the silver mask. The other parts of armor you have to buy at the Shrine Handmaid. Soul of Rosaria - The soul can use to revive Rosaria in her bedroom or to buy bountiful Sunlight miracle from Ludleth at Firelink Shrine. Crescent Moon Scimitar - Scimitar with magic damage. Silver mask - Part of Leonhard's armor set.